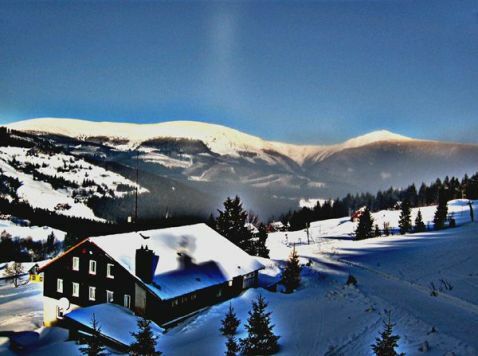 A strange white faint arc appeared on December 17, 2007 on webcam in Pec pod Snezkou, Czech Republic, operated by Humlnet network. Because the webcam is oriented northward, there was a suspicion that at least anthelion could be captured on the photographs. Fortunately, there is an image archive available, so we were able to create stacked image. I used 10 images with apparent anthelion for processing in Registax. The result revealed together with anthelion also quite bright diffuse arcs. There are another 2 examples of webcam images with halos: Parhelion captured by Hydronet webcam in the Jizera Mountains on December 13, 2007. Infralateral and supralateral arcs on Humlnet webcam in Zacler (December 25, 2007).